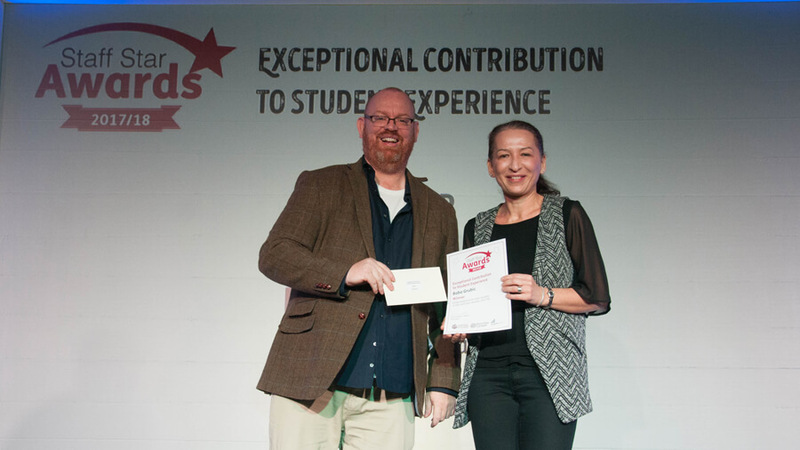 Barnsley College Principal Chris Webb presents Boba Grubic with her Exceptional Contribution to Student Experience Award. Employees from Barnsley College, Barnsley Sixth Form College and University Campus Barnsley have been commended for their inspirational work, commitment and dedication at the organisation’s Staff Star Awards. Staff and students from the College were invited to nominate staff in four categories: Exceptional Contribution to Student Experience, Innovation in Teaching and Learning, Outstanding Colleague and Unsung Hero. Nominations were shortlisted and the judging panel, led by Barnsley College Principal Chris Webb, picked a winner and a highly commended runner up in each category.